Mr Stevens' sole identity, purpose and ambition is to be the perfect butler, but his new American employer simply doesn't understand. Stevens takes a motoring trip to recruit a former housekeeper back to Darlington Hall, during which his mind lingers over the past, and the choices that have determined the course of his life. Gently, almost imperceptibly, this book will crush your heart-- and you'll love it. A once-in-a-lifetime experience of loss, beauty, and longing. Seconded by Jeremy. From the winner of the Nobel Prize in Literature, here is the universally acclaimed novel—winner of the Booker Prize and the basis for an award-winning film. 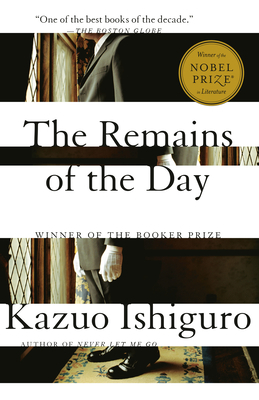 This is Kazuo Ishiguro's profoundly compelling portrait of Stevens, the perfect butler, and of his fading, insular world in post-World War II England. Stevens, at the end of three decades of service at Darlington Hall, spending a day on a country drive, embarks as well on a journey through the past in an effort to reassure himself that he has served humanity by serving the "great gentleman," Lord Darlington. But lurking in his memory are doubts about the true nature of Lord Darlington's "greatness," and much graver doubts about the nature of his own life. Kazuo Ishiguro is the 2017 winner of the Nobel Prize in Literature. His work has been translated into more than 40 languages. Both The Remains of the Day and Never Let Me Go have sold more than 1 million copies, and both were adapted into highly acclaimed films. Ishiguro's other work includes The Buried Giant, Nocturnes, A Pale View of the Hills, and An Artist of the Floating World.